If you don't already know about cystatin C, then it's about time you did. Cystatin C is a relatively new blood test that hasn't become big news yet. A study published just this past month shows how important this test can be, especially in people with a family history of high blood pressure or heart disease. Researchers looked at 500 older men and women who either had high blood pressure, coronary artery disease, or high blood pressure combined with coronary artery disease. They used angiography to determine who had coronary artery disease and just how bad it was. Then they measured their blood cystatin C levels. In their own words, "The serum cystatin C level was closely related with the blood pressure and the degree of the coronary artery stenosis [blockage]. The higher the blood pressure level and the more serious the coronary artery stenosis, the higher the serum cystatin C level." 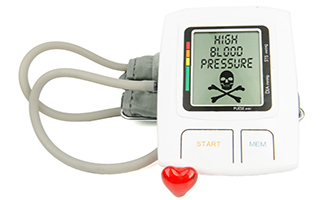 They also found that the cystatin C levels of the high blood pressure patients who also had coronary heart disease were "markedly higher" than the levels of men and women who had high blood pressure without any coronary artery disease. So there's a combined effect. But how high do your levels have to get to be a problem? Another recent study looked at the levels of plasma cystatin C in healthy men and women free of any signs of high blood pressure or coronary heart disease. They found their average range to be between 0.4-1.03 mg/L. So, when you put the results of the two studies together here's what you find. Even if you don't have high blood pressure, if your plasma level of cystatin C is in the top 25% of this range (0.87-1.03 mg/L), you're at risk. And the higher it is, the more likely you are to get high blood pressure as you get older. Also, if you do have high blood pressure and your levels are in the top 25%, your risks for coming down with coronary artery disease are much greater. And if your levels are over the range, your risks increase substantially. This is valuable information because it can help to place you on notice to take proactive measures against these problems before they develop. And here are two more interesting things about plasma cystatin C levels. Starting at the age of 40 years, the levels go up with age. Since it's a marker for high blood pressure and coronary artery disease, this makes sense because they go up with age as well. Second, plasma cystatin C levels also go up with the use of diuretic ACE inhibitor medications. These medications are commonly used for high blood pressure. So keep that in mind. Because if you are on these medications, it may explain any elevation in cystatin C levels that you might have. The authors of the study summed up their findings this way. "The serum cystatin C level of elderly patients with hypertension and coronary heart disease were closely related with the degree of blood pressure and coronary artery disease." After having reviewed the literature on this topic, I think the best levels for cystatin C would be lower than 0.70 mg/L. If your levels are over that, especially if you have high blood pressure or heart disease in your family, you should consider tightening up on your prevention program. Wang Y, Su X, et al. Correlation between serum cystatin C level and elderly hypertensive patients combined coronary heart disease. Int J Clin Exp Med. 2015 Apr 15;8(4):6287-90. EJ, Hock KG, et al. Reference Intervals for Plasma Cystatin C in Healthy Volunteers and Renal Patients. Clinical Chemistry, November 2001 vol. 47 no. 11 2031-2033.